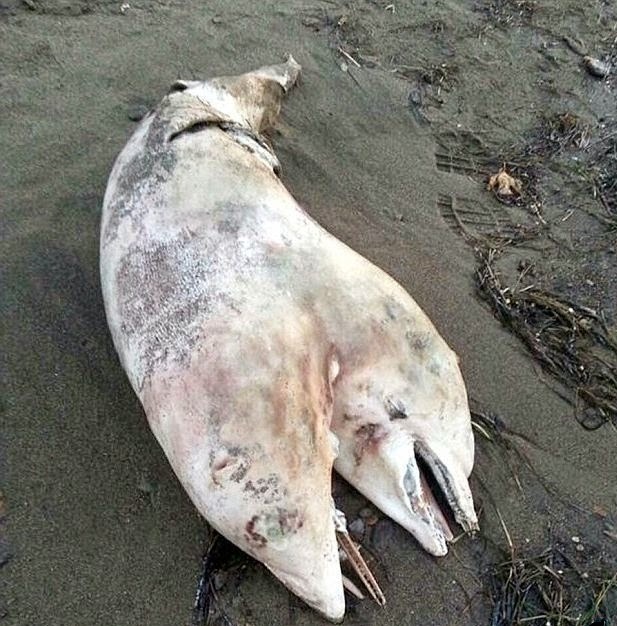 The carcass of a siamese, two-headed dolphin was found on a beach in Turkey this week (August 5 2014). The conjoined body was seen floating onto the shore in Izmir, on Turkey's west coast by Tugrul Metin, a 39 years old sports teacher. The deformed body was 0.97 long (3.2ft) and is believed to have been a 1 year old baby at the time of death. As you can see on the image, it had two heads which shared a common tail. "I noticed the dolphin in the sea and watched as it washed on to the beach. I couldn't take it in at first - I thought my eyes were playing tricks on me. I've never even heard about a dolphin like this, let alone seeing one with my own eyes. I was completely shocked." said Metin. Metin immediately called the police after seeing the deformed creature, who came and transferred it to a laboratory for further investigation. Early examination revealed that the eyes on one of the two heads were not properly opened, neither was one of the blow holes. According to the DailyMail, Mehmet Gokoglu, associate professor at the marine-biology department at the Ak Deniz University said he welcomed the opportunity to study and examine the weird dolphin. "Such a dolphin is a very rare occurrence - similar to the occurrence of conjoined human twins." said Gokoglu.